I mean, of course, the early research for your writing, when you don’t know what you need except bright new ideas, and everything is fair game. We’re not talking last-minute research, when you suddenly find out that every ambulance now carries a perfect antidote for the poison that killed your murder victim. For some reason known only to my unconscious, the protagonist of my mystery novel emerged carrying two ferrets, George and Martha. (If you can think of any reason why this would happen, please do not tell me.) That’s Martha, above. My ferrets cannot talk; readers are not privy to their thoughts, if any; they do not solve the mystery. They just make messes, reveal human character and generally provide uproar when uproar is needed by the author. My first source of ferret information was a friend. She owns seven ferrets. They live on the upper level of her house, separated from the kitchen and her other pets downstairs. I held her ferrets: furry and squirmy. I smelled them. Not close up, there’s no need for that. Ferrets broadcast an aroma that ferret lovers do not find offensive. I played with them: irresistible. They bounce, pounce and slither nonstop. They run with their hind half elevated in a kind of Spy-vs.-Spy hunch. The ferret philosophy of life is WHEE-EE-EE-EEEEEE! 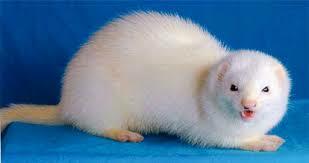 Like mink, ferrets are water creatures. This is Narnia, who runs for the shower whenever she hears it running. Another of my friend’s fuzzies would park herself under the nozzle and stare at it until someone turned it on for her. After the cute-ferret session, my friend sat me down for a serious talk about potty habits. Theirs, not mine. If you are squeamish, ferrets are not for you. If you want to know more, you’ll have to find out for yourself. Next stop: books, books, books. If nothing else, research is a license to buy books. Ask Amazon about ferrets, and it first produces what you’d expect: The Ferret Handbook, Ferrets for Dummies and the alarming How to Stop Ferret Biting in 3 Days. But wait! There’s more! Richard Bach, author of Jonathan Livingston Seagull has written a series of fables about two ferrets, both of whom are writers. I sampled one volume, but my insulin level rose so alarmingly that I had to stop. There is also a 30-page mystery for children, featuring Fiona and Farley Ferret. Here we see one of the reverse benefits of research. Warning: you are entering the Sentimentality Zone. Watch your feet or you will step in something squishy. 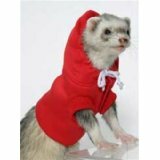 From Amazon, you can buy tiny red ferret hoodies, a high-sided plastic litter pan in a delicate shade of mauve, “The Ultimate Crunchy Advanced Nutrition Diet for Ferrets,” and a ferret decal for your car window. You can also give your ferret a “leopard-design” hammock. Surely this is like offering a shark-design hammock to a herring? Another repressed-hostility product: a wholly edible image of a ferret for the top of a sheet cake. It’s Kosher! Gluten Free! Soy Free! Trans-Fat Free! Buy yours now from Amazon! Next, the wonderful web. You could spend the rest of your life watching cute ferret videos. Fun fact: ferrets are one of very few pets that have a smooth reverse gear. Just try to get your dog to back up. A ferret will do it so easily that he looks as if someone pressed the ‘rewind’ button. Check out the YouTube video, around minute 4:00. Ferret owners are not necessarily mad. But they are very … specific. They are very focused on ferrets. Case in point: a YouTube performance by a proud ferret mommy of the song she composed, “Ferret, Oh, Ferret.” The tune’s her own invention, but it’s kind of like “O, Canada,” sung at a cricket match by a real non-professional. Once you’ve done your research, you come to the hard part. You have to decide what belongs in the book. Ferrets are a lot messier than I want to deal with, in life or in fiction. I can leave the messy parts out of the story. But even when ferrets are misbehaving, they are every bit as adorable as ferret fanciers think they are. I don’t want readers rushing out to buy pets they’re going to get rid of at best and neglect at worst. So I’m planning a disclaimer, with web links, at the end of the book. I will not buy my own ferrets. I won’t. Really. Posted on March 30, 2015, in blogging, Heidi Wilson, research, writing and tagged Ferrets, Research. Bookmark the permalink. 3 Comments. The havoc is *why* to have a ferret. 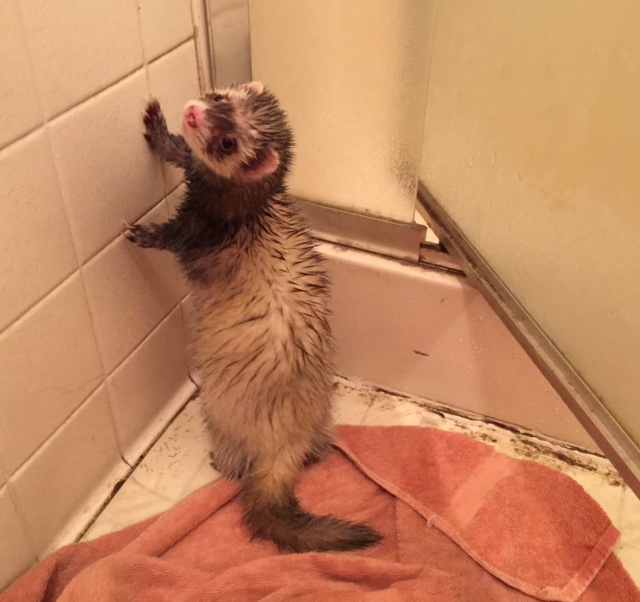 Dook on, ferrets! Entertaining to say the least! I have never seen the appeal of owning a ferret. The havoc they create in your mystery just confirms that…..
Heidi, you are too much. I don’t want a ferret. My daughter has a chinchilla; they are cute and don’t smell. But you make ferrets sound endearing even as they nibble fingers to the bone. Can’t wait for your ferrets to get involved in your mystery.